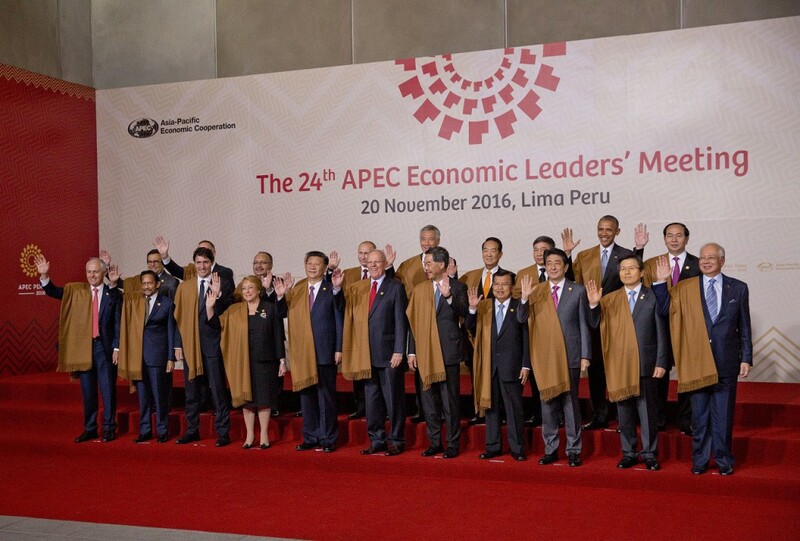 The Asia-Pacific Economic Cooperation (APEC) summit was held on November 19 and 20 in Lima, Peru, and ended with confirmation of the importance of free trade. At the same time, there was a summit meeting between the leaders of the 12 countries involved in the Trans-Pacific Partnership (TPP). With US president-elect Trump having announced his intention to withdraw from the TPP, Japanese dailies discussed this issue in their editorials: the Yomiuri on the 21st, and the Asahi, Sankei, and Nikkei on the 22nd. All four papers praised APEC for confirming its intentions to work towards free trade and fight against protectionism, even with the implementation of the TPP having become uncertain. All but the Asahi also called for persistent efforts to convince the US to ratify the TPP. The Asahi focused on how the APEC Leaders’ Declaration included phrasing about how free trade is “being called into question,” and emphasized that the key to putting an end to stagnation in the global economy and stopping the spread of protectionism is for all the countries to work together to ensure that free trade does not lead to increased disparity and inequality. Stating that the TPP is “the most important foundation” for building an Asia Pacific free trade area, the Nikkei emphasized that “The participating countries, including Japan, should not give up on ratifying the TPP, and must continue moving forward with the necessary domestic procedures.” In particular, the paper emphasized that the Abe government “should ensure that the ratification legislation for the TPP being debated in the Upper House passes.” If that occurs, it would mean Japan was second only to New Zealand in being soonest to ratify among the 12 countries, and the paper argued that “It is necessary to persistently explain the purpose of the TPP to Mr. Trump,” based on this ratification. However, regarding creating a new Asia Pacific agreement without the US participating the paper noted “In the case that the largest economic power, the US, left the TPP, the degree to which it would help grow the regional economy through liberalization of trade and investment would be limited,” and so the 11 other countries would have to maintain solidarity, considering the success of the TPP is predicated on the cooperation of all participating countries, including the US. The Asahi took the position that in order to resist protectionism around the world, bringing about the Free Trade Area of the Asia-Pacific (FTAAP) including the 21 member countries/regions of APEC, the TPP, and the Regional Comprehensive Economic Partnership centered around China are all necessary, and that this APEC Leaders’ Declaration should be used as a new starting point for that goal. *English translations of The Yomiuri is from The Japan News. Those for The Asah, The Mainichi, The Nikkei and The Sankei are provisional. The content of this page was made by the Foreign Press Center Japan and does not reflect the opinion of the Japanese Government or any other organization.